There are a small number of greenhouse gases that help to regulate the earth’s temperature by trapping solar energy. These gases mainly include carbon dioxide, methane, nitrous oxide, and water vapour, each occurring naturally in the environment. When these greenhouse gases are produced through human activity, however, they contribute to climate change. 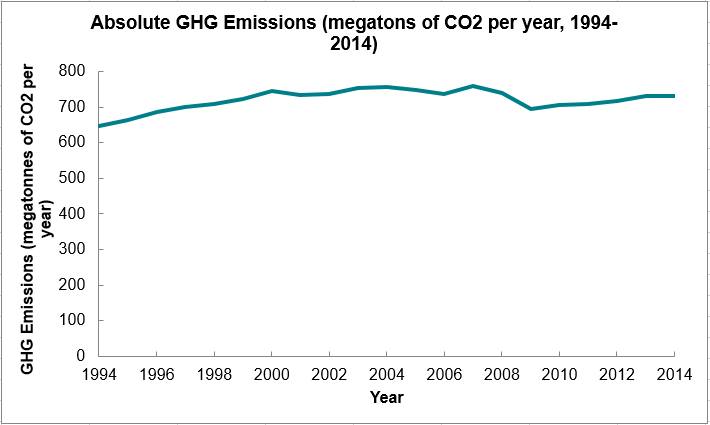 By 2020, Canada’s emission target is 622 megatonnes, which is much lower than the current level. Climate change negatively impacts the availability of environmental resources across the planet. Inadequate access to important resources such as water and fresh food can lead to illness and disease, democratic disruption, and increased violence and conflict; all of which have a negative impact on wellbeing.